The -B Domain for Cisco Access Points | CCIE or Null! I know I am a few months late on this one, but figured it would be worth throwing out there. Earlier in the year Cisco updated and released its access points to be compliant with -B domain regulations set forth by the FCC in North America. After May 1st 2016, all Access points ordered and shipped will compliant with the -B domain, meaning you will not be receiving any access points that are part of the -A domain. This might not seem like a big deal however depending on what version of code you are running on your controller, you might find yourself wondering why your new -B domain compliant access point is not joining your wireless controller. Depending on which software Rev you are running, you may or may not meet the minimum software requirements. This will require you to upgrade the code on your controller before you can actually use these new -B compliant access in your network. UNII-1 is allowed for outdoor use. Originally this part of the 5Ghz band was only regulated to indoor use. Something to keep in mind when the CWNP updates its exam syllabus. UNII-1 is now allowed to transmit power of 1W for both indoor and outdoor use. However restrictions have been put on the EIRP when used outdoor with a 30 degree horizon. New Spectrum density for the UNII-3 bands. Re-opening on Channels 120, 124, & 128 with the restrictions of new testing requirements. This is where things get interesting, as the access are supposed to watch out for other TWDR (Terminal Weather Doppler Radar) signals to avoid interference. So we will see how this goes. However this could provide us some much needed spectrum space in the 5GHz band with 802.11ac creating wider channels. Remember to make sure you clients will operate on these channels before enabling them. 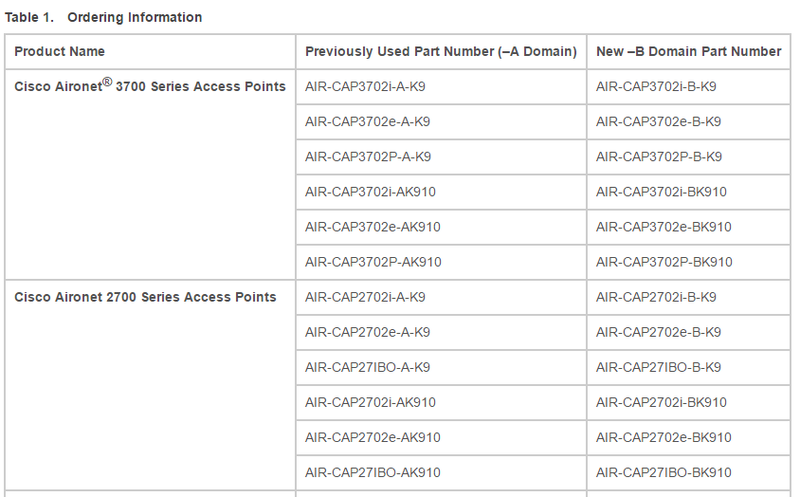 Sample ordering info for the new -B domain compliant access points.